Beeswax & Cotton makes and delivers exactly what you need to kick cling wrap to the curb. With our help you can transform your kitchen to fun, fresh and friendly. Beeswax & Cotton food wraps are designed to replace plastic wrap. 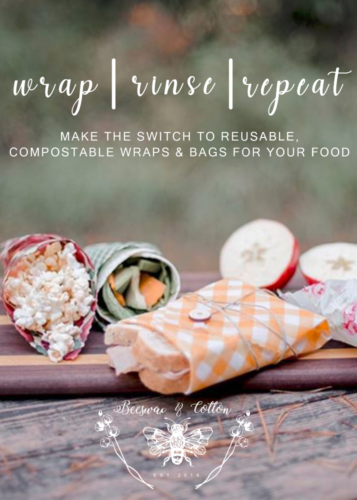 Use them to wrap cheese, fruit, vegetables, snacks, sandwiches, bowls or anything else you would use plastic wrap or bag for. Our products are made by hand with intention in our home using GOTS Organic cotton and Organic materials. We are proudly pine resin and nut oil free. Our product is entirely compostable when it reaches the end of its life span. Our packaging is plantable and our mailers recycled and compostable. We strive to ensure we are not contributing to the output of garbage in your home. Markets, Retail Locations around the province and from our online store. Beeswax & Cotton originated from a desire to reduce single use products in our home. Focusing specifically on plastics our Food Wrap was born. Each Food Wrap is made by hand, with intention in our home. Located in the small Central Alberta town of Eckville our family of 4 strives to live a slower, simpler life. A life with intention. Various shapes and sizes are available on our website.